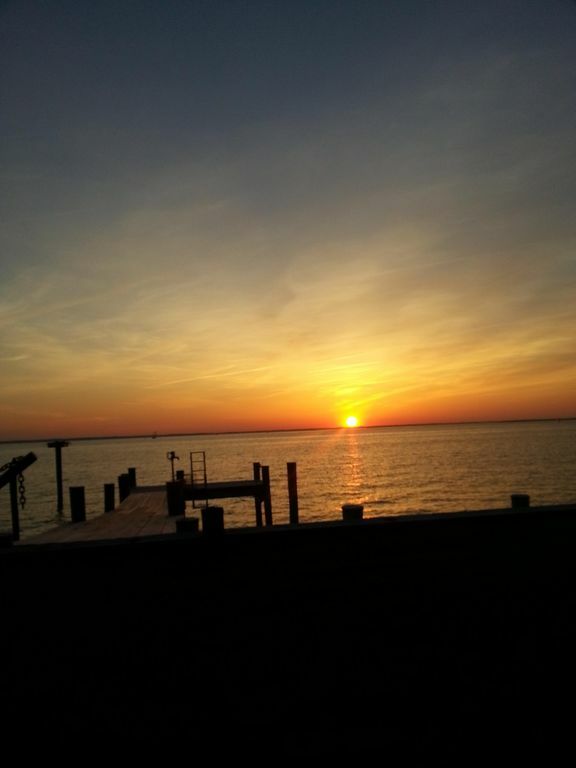 Located on the Chesapeake Bay side of Tilghman Island, this beautiful two-story, three bedroom cottage is available for rent throughout the year. Our cottages have stunning views of the bay from the second floor bedrooms - and private balcony and/or deck. There are hardwood floors throughout, a full service kitchen with dishwasher and microwave and outdoor gas grill. Enjoy the use of the 3 shared docks, crab traps, the Crab Shack (with wood burning stove, small drink fridge, CD player/radio and DVD player) and a Pergola with seating for 4. The dazzling sunsets over the Bay are extraordinary as though they were choreographed just for us. The chatty waterfoul are fascinating to watch and we get daily visits from a wide array of birds, migrating geese, ducks (and ducklings), osprey and the occasional bald eagle. This is the perfect romantic getaway. An extensive bike trail (the new Michener Byway) extends from Tilghman to St. Michaels and out to Oxford via the Belleview/Oxford Ferry. We are minutes (walking distance) from world class restaurants, kayaking, fishing, skipjack tours, historic St. Michaels, and Antique Shops. We arrived in Tilghman Island in 1996 in search of a watermen community much like that of Half Moon Bay (CA) from where we came. We have spent the last 15+ years developing Tilghman Landing into a Chesapeake Bay retreat that we love to share. In addition to building our waterfront cottages, we spend our time fishing, crabbing, boating and enjoying the beauty of our Bay-side retreat. Our cottages are open and airy – with ceiling fans throughout and a nice almost constant breeze blowing across the Bay. We have a hammock and beach chairs available for watching the evening sunset. The property is private, quiet and perfect for a romantic getaway or family get together. Tilghman Island is the East Coast version of Half Moon Bay, California with its colorful history, abundant seafood throughout the seasons (fish, crabs and oysters), maritime activities (boating, kayaking, fishing, jet skiing) and California Sunsets over the Bay. We are also about a mile from Poplar Island (directly off our pier) where a successful restoration effort led by the U.S. Army Corps of Engineers has returned the island to 1,140 acres. When work on Poplar Island is complete the island will be a maze of smaller islands, ponds, channels and marshes. Ospreys, egrets, terns, herons, eagles, double-breasted cormorants, black ducks and other wild fowl have already discovered an enlarged Poplar Island – a true bird-watching opportunity. We are located about 2 hours from Baltimore, Washington DC and Philadelphia, PA. Our guests come from all over the world to experience all that the Chesapeake Bay has to offer. Our cottage is very private at the end of a quiet dead-end road. Our guests often set up bocce ball and volleyball nets and we have a horseshoe pit for some friendly competition. On Saturday night, depending upon the season, we will often cater a Crab or Oyster Feast in the Crab Shack for our guests who want this Maryland Eastern Shore experience. There are year-round festivals and holiday events, an extensive bike trail, world class restaurants, shopping and cultural centers – Tilghman Watermen Museum, Philips Wharf Environmental Center and St. Michael’s Maritime Museum. The Lady Patty, one of the last remaining sailing skipjacks is available for a sunset or daytime sail – within walking distance of our cottages. We have 2 docks that are perfect for sunbathing, crabbing, fishing or just enjoying a glass of wine while watching the amazing sunset. We live on the property and are therefore available to assist with special requests. It is Chesapeake Bay Front. 180 degree views of the Chesapeake Bay with 3 docks for shared use and 4-season Crab Shack out by water with wood-burning fireplace and TV. Shared use of 3 piers and 'Crab Shack' for Crab Feast parties. Crab Shack has small fridge for drinks, DVD player and wood burning fireplace. We often host crab feast parties - purchase, cook and serve the crabs (add'l cost). Hammock and beach chairs available on the property to relax and watch the sunset. A cozy pergola with seating fo 4 is great to watch the dazzling sunsets. There are also bikes available for use on the island. I normally don't write reviews (although I read them so I probably should write them). In a nutshell we loved our trip to Tilghman's landing. We stayed at the Jellyfish cabin and it was perfect for us. The large window that makes up the whole bayside of the house is gorgeous and it helped us enjoy the scenery even while we were inside. I loved that we could swim right off of the dock and that it was standing depth for my six year old during low tide. The other part we loved was being able to bike the whole island. You have to bike on the main road and there is not any shoulder but lots of other people are biking and traffic drives slowly and infrequently. This made for many fun trips to the country store (great breakfast hoagies). Jacque and Patrick are so open kind and unobtrusive. She was very kind to my kids who were obsessed with their cats and love to ask many, many questions. We had relatively good weather although we could only boat one day because of the wind. Even with that challenge we loved how much there was to do on the island and in St. Michael's. It really was a great way for us to reconnect. We chose to come to Maryland from Ohio on a whim for an elopement. We wanted a quiet and beautiful place on the bay and we lucked out finding this gem! We stayed in the Jelly Fish House, it is brand new and gorgeous, just what you would imagine for a beach house. We spent a lot of time relaxing on the dock and in the hammock looking at the beautiful views and sunsets. My three boys had a ball fishing, jumping in the water from the dock and catching blue crabs-we had never seen those before!! We definitely had three teary-eyed boys when it was time to leave. We had a magical weekend! We wouldn't have changed a thing and would love to come back. Jacque and Patrick were fantastic! Our stay was absolutely wonderful!!! If relaxing, peace and quiet with fishing & crabbing is what you are looking for then this is the place for you! Private property at the end of the road! No neighbors around! Breathtaking views and sunsets!!! Great fishing!! The cottage was beautiful!! The colors are so homey that it instantly feels like home. Beautiful views from the deck! Buy some wine from the local stores and enjoy it on the deck. The crab shack would be a great place to gather. Unfortunately our trip was too short and the weather didn't cooperate so we weren't able to take advantage of it....this time. The owners were absolutely fantastic with any questions and so helpful with suggestions of where to eat, shop and buy seafood!!! We are already talking about when we can go back again! My boyfriend and I were in search of a quiet place to escape the hustle of DC for Memorial Day. Realizing it would be our first vacation together, we decided to try Tilghman Landing because of its waterfront views and welcoming descriptions. After 3 days of a perfect vacation, we didn't want to leave. The amenities are more than what you expect and both Jacque and Patrick are exceptionally friendly and welcoming people. They went through the trouble of setting up a crab dinner on Saturday night for us and a few other folks--it was a night to remember with great company. Overall, would highly suggest to anyone to schedule a stay and be prepared for a great visit! Our property overlooks the Poplar Island Bird Sanctuary which is being preserved and developed by the Government. We have hundreds of species of all types of birds including Bald Eagles, Osprey, Herons, and many more. We are walking distance to several marinas where you can rent kayaks, jet skis and fishing trips. We are also walking distance to Philips Wharf Environmental Center and voyages on The Lady Patty - one of the last sailing Skipjacks in the world.